The Cloverway dub had like a million different translations for the chant, practically a new one per episode that the chant was spoken. No they didn't. They had two. "Don't dream that you're all grown up, big dreams are best just for kids" was used in the Amazon Quarter's debut episode. Every other time was "Never doubt the power of innocent dreamers, never doubt the dreams of innocent children". Y'all really need to stop exaggerating how inconsistent the CWI dub was. From what I recall the SuperS dub was nowhere near as inconsistent as the S dub. In fact I don’t recall it being any more inconsistent than the DiC era dub. A lot of inconsistencies were exaggerated tbh. Like what difference did it make if its Uranus World Shaking or World Shaking? It’s not that weird for The Sovereign to be known by multiple titles. Crystal Treasures could also be known as objects of pure power. The only major inconsistencies that I thought were an issue was when attacks were completely way off like Mars Celestial Fire Surround becoming Mars Fire Rings Flash once or twice and stuff like that. I was re-watching the final SuperS episodes with the CWi dub and one inconsistency I was finding was with the Inner Senshi Attacks. Sometimes it started with "Sailor ____!" and othertimes it started with "____ Power!". A lot of inconsistencies were exaggerated tbh. Like what difference did it make if its Uranus World Shaking or World Shaking? About as much difference as it makes whether it's Moon Eternal Power Make Up, Moon Eternal Make Up, or Silver Moon Crystal Power Make Up. It wasn't. Aside from a random attack mishap (there's an episode where "Sparkling Wide Pressure" reverted back to "Jupiter Thunderclap Zap"), the attacks were overall consistent until the Inners got their upgrades. Even then, they just did things like add the Soldier's name or "[insert planet] Power!" before their attacks. They were also better with keeping flashback dialogue consistent. The terminology in S was horribly inconsistent until Mimete shows up. After that, the Messiah was officially "The Sovereign", the Holy Grail was "The Purity Chalice", and the Talisman were "Crystal Treasures". Attacks were mostly okay. Also the term for the Talisman weren't even *that* inconsistent, it was just confusing. They were called mostly "Pure Heart Crystals". So you'd have Uranus and Neptune checking a pure heart, and saying "This isn't a Pure Heart Crystal!"... it was weird. The Death Buster's English name, "Heart Snatchers" was originally a term coined by the Sailor Scouts in the dub, yet eventually became their official dub name. Sloppy, but DIC was guilty of this too. 90% of the villains in the dub never formally introduced themselves, yet the Scouts managed to know their names. Guys, I am sorry for saying this, but why is everything turning into old/ new dub clash. What is the point - old s old, new is new, nobody can erase the old dub, no bashing needed fr all of it. Why can't you be happy that you are having to the show at all, that they are dubbing it for you, that you have all the different stuff and two dubs to compare? Some countries are not as lucky, some of us have to import everything. Why can't some people just be happy about the new licensing and dub, and why others can't respect something that some cherish from their childhood. You are quite lucky having the new manga, Crystal and the old show on every store. The attack screw-ups happened in the Dic dub too. As far as I can recall the Inners Super power attack was consistent outside of sometimes being Sailor X (attack name) or X power (attack name) which isnt a big deal honestly. I was re-watching the final SuperS episodes with the CWi dub and one inconsostemcy I was finding was with the Inner Senshi Attacks. Sometimes it started with "Sailor ____!" and othertimes it started with "____ Power!". CWi actually produced the Latin American SuperS dub before the English one. And they apparently took inspiration from it, because the Crystal Power attacks began with the senshi name there. For example: "Sailor Jupiter! Hojas de Roble de Jupiter!". And "Moon Crisis, Make Up" was translated as "Double Moon Cosmic Power, Action", similar to "Moon Cosmic Dream Action". So far German is for sure my favorite dub of Stars - they pulled off the deep voices really well. Over all German is still my favorite dub, despite the minor censorship and the fact my German is on pretty low level. Healer and Maker sound pretty womanly to me in their male forms. Especially Maker. I am excited for this one obvious. 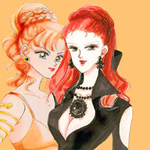 Though one of my reasons for excitment is a weird one, is getting to see Sailor Uranus and Queen Nehelnia interacting. If you are a fan of Trigger, Erica Mendez and Laura Post played opposite each other in a couple of series that did for Trigger. 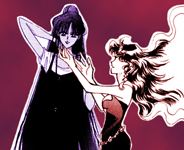 Heck Sailor Uranus and Tellu never even meet. Only voices we'll have to wait until Part 2 to hear will be Sailor Tin Nyanko and Princess Kakyu. Check out episode 19 of the English dub of LIttle Witch Academia, and you get a little preview of what we will see in young Queen Nehelenia. They put way too much stress on the vowel sounds. CHEEEEEEBEEEEEEEYOUUUUUSA. Like... Say her name normally, it's not that hard. Oh thank god I am not the only one who thought it sounded off...I mean...really why put so much emphasis on it? Not lazy. It would cost them a lot to hire a children chorus to sing a song like this, rather than just one of their in-house people. It wasn't covered in the old dub, and I saw that when I was like 10. The plot wasn't lost on me even then, so I think you're exaggerating on how relevant to the painfully simple plot it really is. Besides, an English cover would probably not be great.